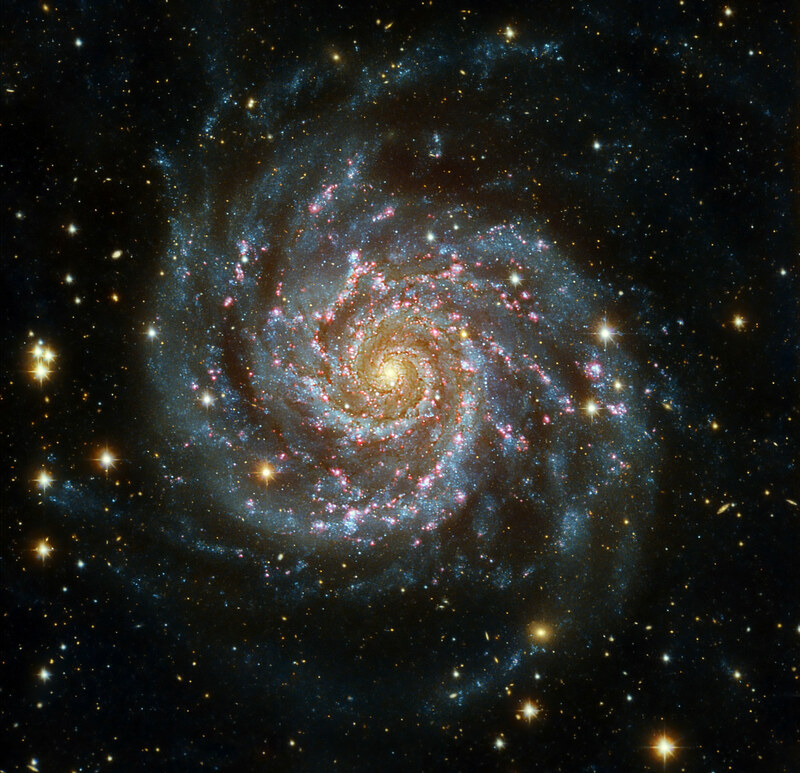 A newly published study from the University of Colorado suggests that spiral galaxies, like the Milky Way, are larger than previously thought. Let’s all fist bump: Spiral galaxies like our own Milky Way appear to be much larger and more massive than previously believed, according to a new University of Colorado Boulder study by researchers using the Hubble Space Telescope. CU-Boulder Professor John Stocke, study leader, said new observations with Hubble’s $70 million Cosmic Origins Spectrograph, or COS, designed by CU-Boulder show that normal spiral galaxies are surrounded by halos of gas that can extend to over 1 million light-years in diameter. The current estimated diameter of the Milky Way, for example, is about 100,000 light-years. One light-year is roughly 6 trillion miles. Stocke gave a presentation on the research June 27 at the University of Edinburgh’s Higgs Centre for Theoretical Physics in Scotland at a conference titled “Intergalactic Interactions.” The CU-Boulder research team also included professors Michael Shull and James Green and research associates Brian Keeney, Charles Danforth, David Syphers and Cynthia Froning, as well as University of Wisconsin-Madison Professor Blair Savage. In addition, the CU-Boulder team discovered giant reservoirs of gas estimated to be millions of degrees Fahrenheit that were enshrouding the spiral galaxies and halos under study. The halos of the spiral galaxies were relatively cool by comparison — just tens of thousands of degrees — said Stocke, also a member of CU-Boulder’s Center for Astrophysics and Space Astronomy, or CASA. Shull, a professor in CU-Boulder’s astrophysical and planetary sciences department and a member of CASA, emphasized that the study of such “circumgalactic” gas is in its infancy. “But given the expected lifetime of COS on Hubble, perhaps another five years, it should be possible to confirm these early detections, elaborate on the results and scan other spiral galaxies in the universe,” he said. Prior to the installation of COS on Hubble during NASA’s final servicing mission in May 2009, theoretical studies showed that spiral galaxies should possess about five times more gas than was being detected by astronomers. The new observations with the extremely sensitive COS are now much more in line with the theories, said Stocke. The CU-Boulder team used distant quasars — the swirling centers of supermassive black holes — as “flashlights” to track ultraviolet light as it passed through the extended gas haloes of foreground galaxies, said Stocke. The light absorbed by the gas was broken down by the spectrograph, much like a prism does, into characteristic color “fingerprints” that revealed temperatures, densities, velocities, distances and chemical compositions of the gas clouds. “This gas is way too diffuse to allow its detection by direct imaging, so spectroscopy is the way to go,” said Stocke. CU-Boulder’s Green led the design team for COS, which was built by Ball Aerospace & Technologies Corp. of Boulder for NASA. While astronomers hope the Hubble Space Telescope keeps on chugging for years to come, there will be no more servicing missions. And the James Webb Space Telescope, touted to be Hubble’s successor beginning in late 2018, has no UV light-gathering capabilities, which will prevent astronomers from undertaking studies like those done with COS, said Green. The study was supported by a NASA/Hubble Space Telescope contract to the Cosmic Origins Spectrograph science team, general NASA/Hubble Space Telescope observing grants to Stocke and a National Science Foundation grant to Keeney. 1 Comment on "Study Suggest Spiral Galaxies Are Larger Than Previously Thought"
What mechanism is responsible for the formation of spiral arms in Galaxies?